Articles of H.O.P.E. is the latest company to take up the fight against plastic bags. The label has just launched its collection of eco-friendly shopping bags. 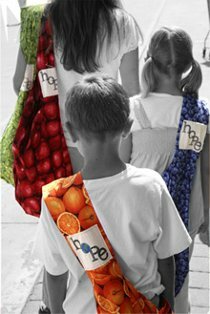 The brand is starting small with two signature lines: the simple but boldy colored H.O.P.E. Sac and the more fashion focused gNg, or Green and Gorgeous, range. H.O.P.E. stands for Help Out Planet Earth, a message which the brand takes to heart. "The facts are clear that single use disposable bags are harmful in a profound way to our environment," explained brand cofounder Karin Bailey. "We have created a bag with both beauty and integrity to enable us to make a simple change in the way we live." While Articles of H.O.P.E. is optimistic that its collection could encourage more people to shun plastic bag, it's not leaving anything to chance. It also campaigns to ban plastic bag altogether, a move which seems to be more than a smart business decision. A portion of sales benefit this legal fight. The H.O.P.E. Sacs are available for $19.99 while the more luxurious gNg purses cost $99 from the Articles of H.O.P.E. website.